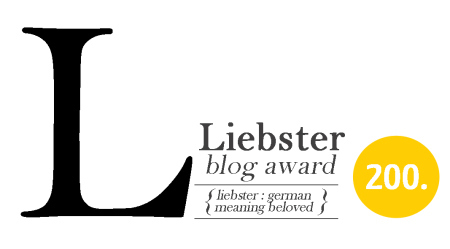 A fellow blogger, Lauren @ Rustic Honey, has nominated my blog for the Liebster Award! Thank you Lauren for the nomination. I would love to have a backyard mini farm in the burbs. I love to go barefoot in the grass. I love to grow things despite not having a green thumb. I enjoy spending time with my husband, he always make me laugh. I love to spend time with my stepchildren, they are fun to be around. 1) What would you do if you won the lottery? I would go the boring route at first. Pay off my bills. The house, car notes, all of the debt in my life. Then go on a trip. To a beach somewhere. Put my toes in the sand and lay in a hammock. After that who knows. Depends on how wealthy I am. Would love to have my own business. Travel a little. Make the lives of my loved ones a bit easier. 2) If you could only eat one food for the rest of your life what would it be? Steak. I have low iron and I crave red meat a lot. It makes me happy. 3) What is your favorite meal of the day? Dinner. I have more time and more variety. Breakfast is fast and early. You can’t do a heavy lunch or you will get sleepy. Dinner can be early or late and there is an endless variety answers to the question: What’s for Dinner. 4) If you could live anywhere in the world where would you go? Savannah, Georgia. My husband and I visited Savannah shortly after we were married for a weekend getaway around his birthday and it was fantastic. I fell in love with the city and I decided that we were going to move there when we retire. 5) What was the last DIY project or craft you did? My last project I did was making a batch of “Clean Cotton” soap. It makes me think of clothes hanging out on the clothesline on a summer day. I love soapmaking it relaxes me after a long day. 6) What is your favorite holiday and why? Would have to be Christmas, because I love shopping and buying gifts for people that I love. 7) Coke or Pepsi? Apple or Mac? Pen or Pencil? 8) What is your favorite blogging memory thus far? The first time I had to write a blog. I felt that people could relate to what I wrote about. As a woman and a sewer I love purses and I thought that other people might enjoy reading what I had to say. 9) Are you an early riser or a night owl? Early riser- I like to get things done and then have the rest of the day to sew and create. 10) What was the last recipe you tried… or pinned? Boil 3 chicken breasts with a packet of lipton onion soup mix and cut into strips when done. Use water to boil the spaghetti. Add chicken, spaghetti, tomato sauce (we used homemade) in a big bowl and mix well. Pour into greased casserole dish. Cover with your favorite cheese. We used about a cup or so of parmesan and mozzarella. Baked about 20 min till cheese was melted and dish was bubbly. 11) What is the best gift you have ever received and what was the worst? Best: Diamond earrings that reminded me of my wedding ring. If you were a superhero (or heroine), what super powers would you want to have? If you could live anywhere in the world and money was no object, where would you live? How many pets do you have? If you don’t have any pets, do you want a pet? Why do blog? What is your inspiration for your blog? Which project are you least proud of and if you could fix it, what would you do? What is one of your proudest moments from your childhood? If you could be 18 again, would you and why? What is your favorite recipe to make for friends or family? This entry was posted in Liebster Blog Award and tagged awards, Blog, Blogger (service), Christmas, green thumb, Liebster Award, Random Facts.